Series 4 Controller Features Vision Series 4 Controller puts next generation technology in your hands! Enhanced electronics make it faster, friendlier and easier to use. It's most noticeable feature is a smaller form-factor and included hand-held pendant! Now you can inspect your project from every angle and have instant access to the controller's functions. 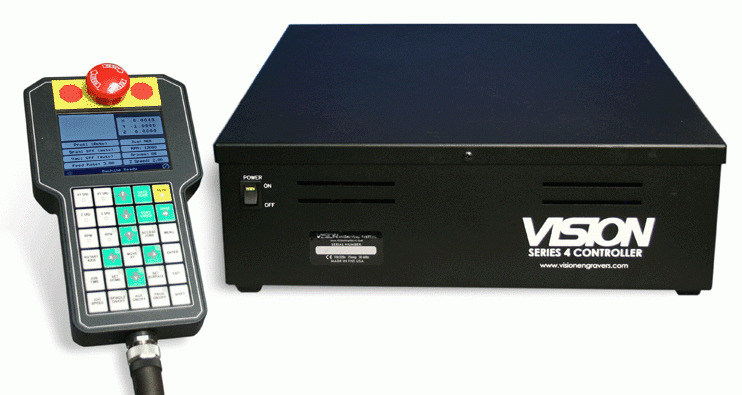 Be highly productive finishing projects faster and easier with Vision's Series 4 Controller! The Series 4 Controller Offers: • Engrave up to 10” per second • Hand-held pendant with large LCD display included • Adjustable table speed, Z axis speed and dwell • HPGL/2 and G code compatible • Programmable defaults and re-engrave from any position in the job • Open architecture • 3-D and 2 ½-D capable • Optional 4th axis control for rotary attachment • Software upgradable by ethernet connection • X, Y, and Z axis positional display for easy offsets • Retrofitable to most manufacturers’ engraving tables • Works directly with Vision Software, CorelDRAW™, Flexi-Sign™, SignLAB™, EngraveLAB™, Enroute™, Type 3™ and other software Applications: Sign making, Jewelry, Medals, Pens, Trophy & Plaques, Parts Marking, Badge Engraving, ADA Braille Signs, Wood Engraving, Plastic Engraving, Metal Engraving, Tag Engraving, Control Panels and more! Software Support Flexi-Sign, Corel Draw, SignLAB, EngraveLAB, Enroute,Type 3, Vision LT or Pro and other leading Software! Protect your investment with an extended service plan before your warranty expires! Extended Service Plans cover the cost of service parts, labor, and annual preventive maintenance completed at the factory. For more information or to purchase a service plan, please call our technical support department at 602-439-0700.